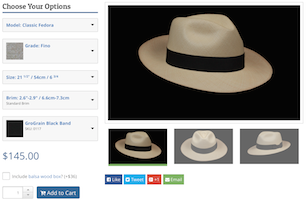 The Classic Trilby Panama hat is similar to the classic fedora, but not! If it had a taller crown it could be a western model. It's blocked in standard oval. The standard crown height of the Trilby model is 4.75" measuring from the brim to the top of the point on the side of the hat. The back of the crown is exactly the same as the front, measuring between 3.75" creating a level appearance. Send us your question about this Cuenca Grade 4 Trilby hat, and we will respond to you as soon as possible.